Grants are available to local voluntary community organisations and groups benefitting local residents and operating within the Wythenshawe area. Priority will be given to small unfunded voluntary and community groups. HOW MUCH CAN YOU APPLY FOR ? Grants are available between £200 - £2,500 per application. HOW OFTEN DO THE PANEL MEET? The panel meet every 8 weeks. Please see the attached application form for further information on who can apply. Section 1: ensure you fill in the full contact details. Complete all sections with as much detail as possible. The more you put in the less questions we will have to ask. Ensure you give full details about the money you require, breakdown the details and give quotes where possible. Section 2: only established groups should fill in this section. By established we mean 1 year or older. Ensure you send in the relevant information required i.e. constitution, accounts, bank statements. Section 3: This should be filled in by new groups, less than 1 year old. Please answer all questions. Section 4: This is an opportunity for you to give us a little more information about your group/project and what you aim to achieve with the funding if approved. You may also wish to send in copies of any current publicity to give the panel more information about your group. Signatories: please ensure that this section is completed and signed by the two nominated members from your group. This year (2017/18) WCHG Community Grants provided a total of nearly £52,000 in funding to Local Community Groups funding 33 local groups along with 7 youth projects and 11 events for the Jo Cox ‘Great get together’. Wythenshawe Black Belt Academy (WBBA) teaches Martial Arts to local people aiming to raise confidence boost respect and increase the feeling of safety in the local area. We run classes 5 days of the week from our Club House in the following marital arts styles Arnis/Kali/Escrima/FMA, Brazilian Jiu-jitsu, Jiu-Jitsu (Jujutsu/Jujitsu), Judo, Karate, Kempo/Kenpo for children and adults. WBBA was given funding to provide a ‘Women Only’ training in self-defence for victims of Domestic Abuse they link up with a local Domestic Violence project which supports around 15 women per week and provided a years’ worth of 2 hourly sessions. The grant covered half of the running cost of these sessions such as room hire, tuition cost and hire of equipment. The session involves aspects of self-defence to support the women in keeping safe with the main aim being to increase the self-esteem of the women and build confidence helping to empower them to rebuild their lives after very difficult circumstances. Jo Cox – Great Get Together Events. The Great Get Together was a national initiative set up this summer by the Jo Cox Foundation. The Charity wanted to remember the late MP by holding “Britain’s biggest ever tea party”, by creating community events all around the country where people could get to know their neighbours better. Wythenshawe responded to this by holding 11 events, involving over 3000 people within our communities. 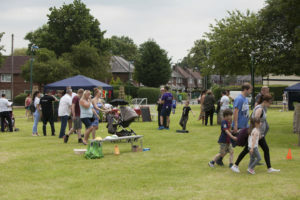 We held a flagship event in Benchill where we held a family fun day with fairground rides, stalls and other attractions. We also held an additional 10 events round the estate, giving small, localised communities the chance to hold a celebration where they lived. Aside from the usual tea party style events, we held a “beach party”, provided 100 Sunday lunches at an intergenerational event and even had karaoke for one of our pensioners groups! A grand day was had by all and we are now looking to make this an annual event for our residents to get involved with and bring communities together! The Grants Panel set aside £5000 for Wythenshawe Youth form to allocate at a participatory budgeting event , the Group funded 7 different projects from the Proud Trust ( LGBT youth group ) to a Classroom Beats a mixing masterclass. Additional support through our funding portal. In partnership with The Forum Trust, Wythenshawe Community Housing Group currently host a funding web portal for local community voluntary organisations to register and search for relevant funding for their organisations. The portal provides free access to a range of current funding initiatives which are available across the country. The registration is quick easy and free. Just follow the link below to start your funding journey. You will also find on this page our guidance to using the portal and helping you with your searches. If you require any other support feel free to drop in to Alasdair’s digital sessions at Benchill Community Centre on a Wednesday morning or Friday morning at Woodhouse Park Lifestyle Centre.